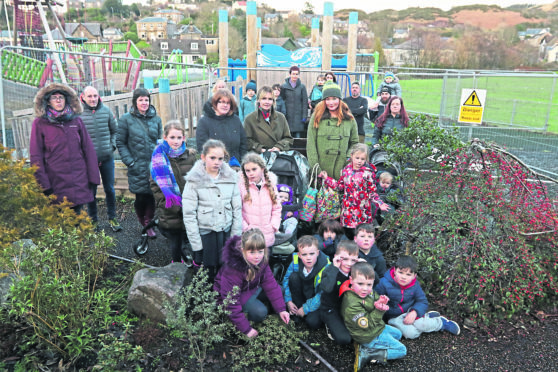 Children, parents and campaigners at the Oban Community Playpark which was paid for by community fundraising and grants. The town’s award-winning £334,000 playpark has been closed for almost a year while insurers investigate the cause of a problem with its flooring, and decide whether to pay out. Oban Community Playpark based at Atlantis Leisure opened in February 2016 but closed in March last year when the flooring, made from Eco Tumble, or recycled forklift tyres, started to split. The community had raised the cash for the state-of-the-art facilities though fundraising events and grants. Lyndsay Elliot, chairwoman of the playpark fundraising group, said: “I am extremely frustrated with Wicksteed, the company who installed the playpark, as they are dragging their heels regarding resolving the problem and getting our playpark open again. The problem is currently with their insurance company to decide on liability and no date for the outcome of this decision has been given. The issue with the flooring was originally acknowledged more than two years ago, in October 2016. “They are saying it’s not their fault, it was bad luck. Originally there was a much smaller park at the site, which only catered for children up to 10 years old. The new park is twice the size and split into two phases, one area for up to five years old, the other five to 15 years. It has equipment accessible to children of all abilities. The area for older children is the part which has been closed. The closest alternative is in Stirling, a two-hour drive away. Ms Elliot said: “We don’t know when the insurers will give an answer. If they don’t pay out we are in a difficult situation. The council could take Wicksteed to court and that could take goodness knows how long. “I don’t think the senior management at Wicksteed realise quite how important this is to the community.